The last time we shared with you all, we left off as we were en route from Lagos to Douala, having escaped the chaos caused by the oil strikes with the help of God. Sitting on the plane to Ghana, we were elated and little frustrated at the same time. Elated to be getting out of Lagos and to that we would be able to see some of the saints in Ghana again, and frustrated at not being able to get to Cameroon yet. Still, we were very grateful to God for watching over us and for all those who had been praying for us. Touching down in Ghana was a bit surreal for me (Jeremiah) to be honest. I have landed in that airport more times than I can count. This was the first time that I was going for a visit, instead of going there because it was my home. I felt a pang of homesickness for Ghana, but this was washed away when, after getting through immigration very easily, (the immigration officials were very understanding, having heard about the crisis in Nigeria), we were reunited with some of our fellow saints. Jeremiah's parents were there, along with Stephen and Kukua Jantuah and their kids, and David and Gifty Sarpong with their two girls. I must say, I wondered to what extent God allowed us to be diverted just so that we could bring great joy to my parents when they got to see their grand-kids again. Well, we were in Ghana again, and now had to figure out what to do next in order to get to Cameroon. We were told that there might be a flight on Air Nigeria the next morning at 6:45 to Cameroon, so we should come to the airport and check. So, after getting to sleep around 3 a.m., Rhys, Sharon, and Jeremiah headed to the airport to see what would happen. Well, once again, Air Nigeria had fed us a false hope. There was not a flight at 6 they said. Then, at 5, they changed and said there would be, but that it was going to Lagos, and not to Cameroon, something we were obviously not interested in doing. "But!" they said, "there might be a straight flight at 8:30 to Cameroon, we just needed to wait for the ticketing office to open up at 7. So, we waited another hour and a half, then found out, yes, there is a flight to Douala... the only catch is that it was leaving 30 minutes late, and we'd have to disembark in Lagos and change planes... in the space of less than 10 minutes. Even if we made this change, there was no way that our luggage would. So, we gave up on Air Nigeria. Their pervasive dishonesty, bait and switch tactics, and utter disregard for passenger's welfare, was just too much for us. So, we decided to try other ways to get to Cameroon. Finally, we found out that there would be a flight out of Lome, Togo, on Tuesday, 4 days later. Well, we would have to get these tickets on Monday, and also get Jeremiah's visa extended so that he could stay in Ghana till then. The best thing about our layover was getting to spend Lord's Day morning with the saints in Accra, Ghana. We had a wonderful time assembling together with them. Jeremiah shared his program about Cameroon plans, and we enjoyed hearing Jeremiah's dad, Jeff, preach.We thank God so much for the opportunity to share with the saints there. Out of a rough situation, God helped us to be able to have a fantastic time visiting and encouraging. See, God never promises that we won't go through rough times, or even that when we do, everything will work out nice and rosy. What He does promise is that through those tough times our faith can grow. I know that seeing all the answered prayers during this time caused my faith to grow! Monday, we made our way to Togo, driven to Lome from Accra by a Nigerian! (God has a sense of humor doesn't He?) We spent the night in Togo, and then the next morning took the shuttle to the Lome airport. Once again, we had a bit of a test, as we found out that our flight, which we had been told was a straight flight, actually stopped in Lagos!!! Well, we were about to have to look for other options, as we were not going back through very unstable Nigeria again, but then we found out that we would not have to disembark, but would remain in the plane. 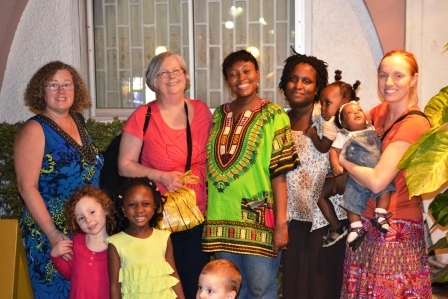 Still, there were about 15 tense minutes when we arrived in Lagos, but we rejoiced in another answered prayer when we finally took off for Douala, Cameroon! How exciting. 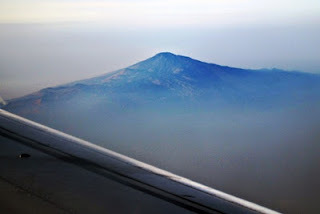 Our hearts leaped with joy when we saw the top of Mount Cameroon rising out of the Harmattan (seasonal dust cloud that covers much of sub-Saharan Africa, as winter storms in Europe send Saharan sands south). We touched down a few minutes later, and finally, with great joy could say that we were in Cameroon! Answered Prayers- TOO MANY TO COUNT! Thank you all so much, and especially thank God! Also, a huge thanks to Rhys and Sharon Thomas, who went with us on this trip, had a great attitude through everything, and were an enormous help. We can't imagine the trip without them. A thanks also to Jeremiah's parents, who were a big help in Ghana as well, and to so many unknown persons who prayed for us and who through their prayers, opened doors for us. God bless you all. We are now safely in Cameroon, and so excited to be able to be serving here. It's been a very busy first week here- read all about it in a blog post coming soon! God bless, and stay strong in your faith! Pictures! They aren't in order, but after it took 3 hours to upload them, I didn't have the heart to remove them and rearrange them... sorry. Jeremiah's Dad preaching in Ghana. Brittney teaches Sunday School in Ghana. On the way from Accra to Lome, Togo. Rhys changes money at the Lome Border. Brittney, Hannah, Jonathan and Sharon with Jeremiah's Mom, Sherrie, Kukua, Zoe, Gifty, Petra, and Lauren in Ghana. Our first sight of Cameroonian soil, Mount Cameroon rising out of the Harmattan. First post from Cameroon! Hurrah! Things are going well here. We've met someone who may be able to help us with our immigration formalities, we have a few houses that we are considering, we've met some friends, and handed out our contact info, we've been pretty busy the few days that we have been here. We will share more about our first few weeks in Cameroon at another time though... for now, let's look back to see how we got here... at which point the screen gets wavy as we take the reader back in time. It all started on a brisk January Wednesday morning, January the 11th to be exact. We, the Hostetter crew of Jeremiah, Brittney, Hannah and Jonathan, along with the Thomas crew of Rhys and Sharon, bundled into two cars and headed to a McDonald's, where we would meet a shuttle bus that would take us to the first of a planned four-flight trip, to go from Kansas City to Dallas. Everything went smoothly on this flight, as well as the next two, from Dallas to London, and from London to Lagos. We were even able to enjoy a leisurely breakfast in the London airport before boarding our flight to Lagos, Nigeria. Little did we suspect the chaos that awaited us. Even when we arrived in the Lagos airport, we had no idea of the upcoming challenges, as we cleared immigration and waited for our bags. The plan was to check in to our next flight, which was to be the next morning at 11:35 and then spend the night in one of the lounges, thus avoiding dangerous, expensive Lagos, Nigeria. Only when we saw the mob of fighting, shouting, surging people in the departure lounge did it begin to dawn on us that something was wrong. We had heard nothing on the news, been told nothing by the airline, seen nothing on the internet which to alert us to the fact that their was a full-blown strike on all transportation and public services in Nigeria going on, mass demonstrations and protests, riots and a number of people dead. We only found this out when we went to inquire about our continuing flight. "There is no flight," was our answer... not that the flight was delayed, or has been rescheduled, or that they will put us on another flight to Cameroon... "there is no flight." That was the final answer from Air Nigeria. What about a hotel? Connections? "You will have to see to it yourself. Maybe next week, the strike will end and you can go, but that is not even certain." So there we were, stuck. The airport was absolute madness, armed soldiers crawling all over to try and prevent the protestors from attacking again, fights breaking out, no air-conditioning or fan, and hundreds of people packed into a small space. What were we going to do? Well the first thing was to rely on God. We had hundreds of prayers at our backs, and knew that, whatever the outcome, God would be with us. We did not have a promise that it would be easy, but that God would be with us, and that it would work out for good. So, it was late at night, the airport was crowded, noisy, and dangerous, so we decided to find a hotel and get some rest, and then figure things out the next morning. Praise God, we had enough cash with us at the time, since no one in Nigeria could accept a credit card because of the strikes. We went to the hotel and prayed that things would work out the next day. The situation seemed pretty grim. Because the president had raised the price of gas from 65 Naira a litre (which is less than $2.00 per gallon) to 141 per litre (which is about $3.89 per gallon) by removing the subsidies that the government had been supplying, the people of Nigeria had responded with violent protests and a national strike on transportation and many other businesses. This had in turn led to a huge spike in the already extreme crime rates in Lagos, further worsening the situation. Things looked fairly grim. While the international flights were available, it would mean we would have to turn around and head back to the United States. We tried calling the US Embassy the next day, but they could only tell us that the situation was extremely dangerous, and advised us to get the first possible flight back to the United States. When Jeremiah went to the airport the next morning to check on whether or not there would be a flight to Douala, Cameroon, he was told that there would be no flights to Cameroon at all that day. On the way back from the airport, a group of hoodlums stopped the hotel car and threatened to bust their windows if they didn't give them some money. We finally decided that we needed to get out of the country as soon as possible. The only possibility was to go to Ghana, and from there, we were told by Air Nigeria, there would be a direct flight to Douala Cameroon. Would Air Nigeria refund our ticket, or give us new tickets less the price of the originals? No. Praise God, we had just enough cash to purchase our tickets to Ghana. However, we again hit a roadblock... Jeremiah did not have a visa for Ghana. Usually they would not allow me to fly on this flight. However, because of the extreme circumstances, for a fee, they finally decided to let me on. So, we checked our luggage in, paid an excess luggage fee, and then went through security to board our flight, after almost 5 hours in the worst airport you can imagine. We knew though that many, many people were praying for us, and it showed up in many ways: the man who allowed Jeremiah to fly without a visa, the lady who only charged us half-price on our transit visas, the friendly and helpful hotel manager who did the best he could to help us, the lady who let us get in line in front of her because we had kids, the fact that the demonstrations were put on hold for the weekend, long enough for us to get out, and the fact that we all had the strength to lug around 7 bags weighing approximately 40 pounds each, plus 8 carry-ons and 2 kids, all the while keeping our attitudes and not cracking under the extreme stress and pressure of the situation. We had just enough money for the flight that we needed, leaving Nigeria with less than 200 dollars in cash. In so many other ways, things worked out in Nigeria. Next blog post, we'll share about the second leg of the trip, in which we visited Ghana, Togo, went back to Lagos! 8-0 and then finally made it to Cameroon. More prayers were answered, and God really did accomplish some positive things through this difficult situation. For now, here's some pictures.Will try and post a short video clip later. Thanks for all the prayers guys, they are crucial! Jonathan waits for our first flight, from Kansas City to Dallas. Outside the Lagos Airport departure lounge. Hannah fell asleep on one of our bags, as there was no where to rest in the Lagos Airport. Farewell America, Cameroon Here We Come! It's our last night in America, tomorrow morning we head out. I just wanted to take a moment, in all the packing and final preparations, to encourage you all. We have been blessed beyond description this trip in the US of A. There have been so many times when I have been absolutely stunned at the way God has worked things out, and how His people have had great faith and have poured out of their lives to help see the gospel spread in Cameroon. Thanks to all the Churches who have welcomed us to come and speak and preach and share, and who have shared with us in so many ways. Thanks to all the individuals who have done the same, and who have welcomed us into their homes, and who have taken us out to eat, and who done so many various things to help us on our ways! Thank you all. Thank you also to all our saints in Ghana, India, and around the world, who have told us that they are praying for us and thinking of us and fasting for us, and have also been an encouragement to us. We are humbled to know how many saints are praying for us and thinking of us. God can do amazing things, and all these prayers, reaching Him, and petitioning Him on our behalf means more to me than I can possibly express. Thank you all. I want to share this picture with you... the light is going to Cameroon. This couldn't be happening if it was not for you all sharing that light and shining that light to us... casting my mind back on the way that our lives have been bathed in the Light of God's Love. Let it shine Lord, let your light shine through us now. God bless, and we look forward to sharing with you all our next post from Cameroon! Brittney's Aunt Debbie costumed as a character in her church's Journey to Bethlehem in OKC. We really had an enjoyable time, and Hannah especially liked it when the "angels" sang. Jonathan ready to help daddy with his presentation at Putnam City Church of Christ in OKC. How sweet the fellowship of the saints- Brittney with Ms. Claudia Tripp at the Northwest Church of Christ's Ladies' Christmas party. Daddy's girl, Hannah gets a little love from Jeremiah at the Callaway County Daddy-Daughter dance, which was also a benefit for the Susan G. Komen foundation. What a wonderful time it was (chicken dance included). Great times with family and fellow saints, the Osebrehs (Havilah, Attah, Jessica, Nile and Zion) in Fayette, MO. What a blessing their visit was! Enjoying an encouraging message by Thurman at the Fulton Church of Christ. Brittney helping teach the littlest kids' class at Fulton Church of Christ- that's Jonathan and Macey. Jeremiah preaches "In Ghana" via the wonders of the internet (Skype). What a great opportunity to encourage and be encouraged! Jeremiah shares our presentation at the Centralia Church of Christ. Christmas Eve Dinner with Brittney's family. It was wonderful to be able to spend time with the family, and was our first Christmas with them. Here comes the New Year! Getting ready to pop into 2012 with the saints at Fulton Church of Christ. Brittney and Hannah with ladies from the Warrensburg Church of Christ, having a great Bible study. If half of the resolutions that people make at the beginning of the year, were carried out, half of the time, imagine what a world this would be... there'd be so many healthy, effective, patient, multi-linguistic, instrument-playing people out there. Sadly, the VAST majority of New Year Resolutions' go the way of politicians' campaign promises.I'm not excluding myself from this. I'm a pretty ambitious person, and have made some pretty outlandish New Year Resolutions over the year, so I'm sharing with you from my failures as much as from successes. So, here are some tips, to help us all have a more productive 2012. Basically, I encourage you to set goals, not resolutions. What do I mean? "I'm going to lose weight," versus "I'm going to run a 5K by the year's end." The more specific we make things, the more likely it will get done. Make goals for 2012, as opposed to 2012. If for example you want to "be a better dad," try and make it more specific, such as- "Do daily Bible time with my kids every evening," or something along that line. Goals need to be: a) written (or typed or entered into our smartphone), b) challenging (eating a large cheese pizza would not qualify if you are a teenage boy), c) believable (dunking a basketball if you are 70 year old grandma would not qualify), d) specific (read through the entire Bible, for example), e) measureable (such as a waistline, body-weight, number of books, race time, a page of prayer journal a day, for example), and f) have a specific deadline (by December 31st, 2012 for example). Also, since we are Christians, look for goals that are spiritual, or have a Biblical connection or motivation. For example, if your goal is to get in good shape, think of "buffeting your body and making it your slave." So set some goals, and then place them somewhere you won't lose it (guilty of that many times), where you will see it every day, and where someone else can see it as well. Remember that stuff gets done when you walk by faith not by sight... when you recognize that, as Christians, we are powered by the spirit, not by willpower, and that if God promises something, He will keep His promises. Ok, so here are a few (again, I'm pretty ambitious, so I've got a lot more) of my goals for 2012. Please feel free to share some of yours, so we can pray for and encourage each other! 1- Read the New Testament each month. 2- Memorize a verse of Scripture daily. 3- Keep a prayer journal. 4- Get Bible studies with 10 different people. 5- Complete the Rosetta Stone French Course Level 5. 6- Win a Cameroonian to Christ. 7- Run 2 kilometers in 12 minutes. Well, those are a few of the things that I'm trying to get done this year. (There are many, many more). God bless you guys, and we pray you all may have a great 2012.